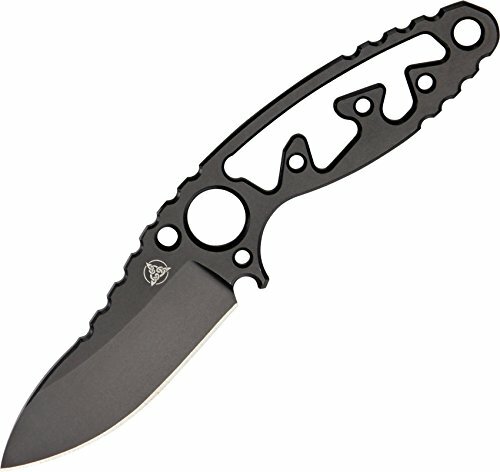 Nemesis NE16B Afterburner Neck Knife by Nemesis at Freedom from Government. MPN: NE16B. Hurry! Limited time offer. Offer valid only while supplies last. This gorgeous Afterburner Neck Knife has the finest details and highest quality you will find anywhere! Afterburner Neck Knife is truly remarkable. This gorgeous Afterburner Neck Knife has the finest details and highest quality you will find anywhere! Afterburner Neck Knife is truly remarkable. Product Details: Condition: Brand New Item SKU: SS-BRK-NE16B Information: 5 1/4" overall. 2 1/4" blade. One piece black finish 9Cr13 stainless construction. Skeletonized handle. Molded black Kayden sheath. Beaded neck chain. If you have any questions about this product by Nemesis, contact us by completing and submitting the form below. If you are looking for a specif part number, please include it with your message.